Fifty or a hundred years ago almost every child in America would know that song because it was sung in classrooms all over the country. No matter that many American children lived in cities and had no experience of sleighs or woods or even Grandfather’s house, which might have been across the ocean instead of through the woods. Today the song would mean even less to children who may never have seen a real horse much less a spinning top—dolls we have with us still, although not like the ones our grandmothers had. And so the song drifts off into history, but it is the only legacy left by a remarkable woman who would probably spin in her grave if she thought that of all the books she wrote, lectures she gave, and magazines she published, only this trifling set of verses is left. What has happened, she might wonder, to the explosive stories she wrote about intermarriage, abolition, and the rights of American Indians. Those were the works that led the Boston Athenaeum to revoke her free borrowing privileges. Lydia Maria Child was a firebrand despite the decorous cap and long, sedate dresses she wears in her portraits. Born in 1802 in Massachusetts, she was a member of the first post-revolution generation. Her father Convers Francis was a prosperous baker and her older brother, also named Convers Francis, became a Unitarian minister and a professor at the Harvard Divinity School. It was her brother who encouraged her to try writing a novel and she completed Hobomok, with an American Indian as its hero. It was a popular success and started her on a lifetime writing career. When she met the Harvard educated lawyer David Childs she was introduced to the abolitionist cause. They married and pursued lifelong careers as reformers and radicals. Unfortunately David was constantly in debt, made innumerable bad choices in business investments, and even spent time in prison for debt. Lydia (usually called Maria, which she preferred) had to be the stable breadwinner. She did this by starting a children’s magazine and by publishing books directed at housewives. Her hugely popular Frugal Housewife addressed the problems of middle-class women who struggled to maintain a house and feed a family. An unjust law exists in this Commonwealth, by which marriages between persons of different color is pronounced illegal. I am aware of the ridicule to which I may subject myself by alluding to this; but I have lived too long, and observed too much, to be disturbed by the world’s mockery. In the first place, the government ought not to be invested with power to control the affections, any more than the consciences of citizens. A man has at least as good a right to choose his wife, as he has to choose his religion. Her sentiments shocked even many of the abolitionists who wanted to abolish slavery, but hesitated over the question of total equality. Maria Child spent most of her life facing controversy. She believed that men and women should work together in the Anti-Slavery Society and precipitated a long-lasting feud in that group. For all her long life she argued for freedom and equality. On this Thanksgiving Day we ought to give thanks to her, not for producing a sweet little verse, but for persisting in the endless struggle to make Americans live up to their highest aspirations. 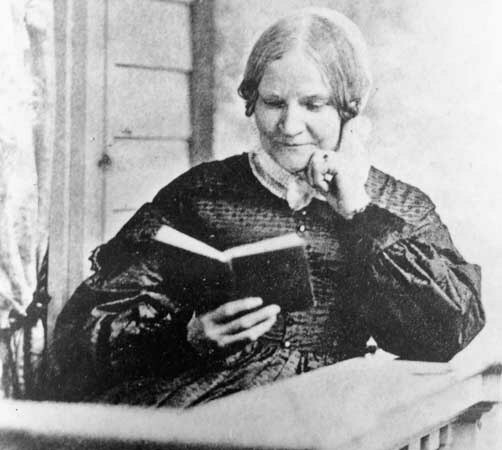 As far as I know, there is no easily accessible biography of Lydia Maria Child. The one that I read is a detailed scholarly biography by Carolyn Karcher, The First Woman in the Republic: A Cultural Biography of Lydia Maria Child (Duke University Press 1994). I highly recommend it, but not too many people will commit to 800 pages. Perhaps someday Professor Karcher will produce a shorter, more popular introduction to a woman who deserves more attention than she has received in our history books. Another fascinating post, another fascinating woman! It’s admirable and encouraging that Child was able to envision not only the abolition of slavery but even full equality for African-Americans. Knowing that someone more than a century ago was able to advocate for something we still have not achieved should inspire all of us to keep pressing on. Thanks for bringing this wonderful woman into the limelight!